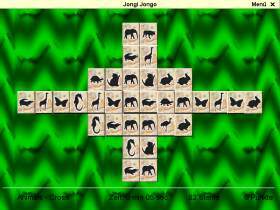 Caiman free games: Jongi Jongo by Dirk Schubert. 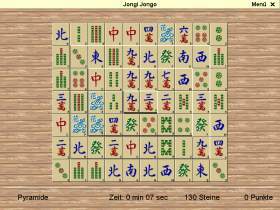 Jongi Jongo is a solitaire version of the well-known ancient chinese game of Mah-Jongg. The goal of the game is to clean up a board of 144 tiles by finding and discarding matching pairs of tiles. Jongi Jongo is een Mah-Jongg spelletje waarbij je de steentjes moet trachten weg te spelen door telkens 2 gelijke steentjes aan te klikken.